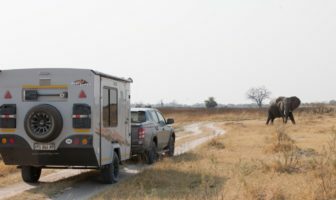 Last year, we followed Australian couple Uwe Bockmann and Meg Stuart as they travelled through Namibia and Botswana in their EarthCruiser EXP motorhome. 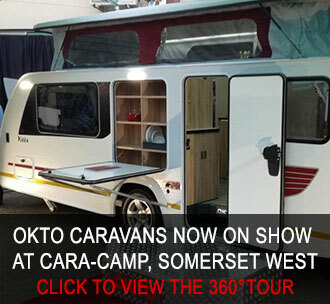 Now, we join them back on South African soil, as they travel to the Blyde River Canyon, into the Kruger National Park, through Swaziland, and end their adventure in Port Elizabeth, from where their motorhome will be shipped back to Australia. 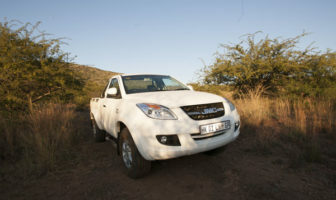 We crossed the border to SA at Platjan, not far from the Limpopo River Lodge. The officers on both sides were very friendly and efficient. 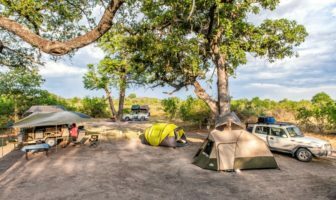 Our plan was to camp at the Mapungubwe Nationality Park camp site, but we soon discovered that all the sites had been booked for the school holidays. Instead, we found a nice, quiet camp with lovingly maintained facilities at Ratho Bush Camps, about 15km west from Pont Drift. 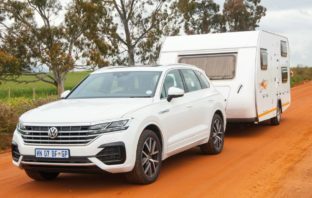 It’s part of the local citrus-growing operation and crocodile farm, and offers cottages, luxury tented camps, a well-equipped camp site and a remote 4×4 campsite next to the river. The main camp has a communal seating area that also serves as a wildlife-viewing platform. 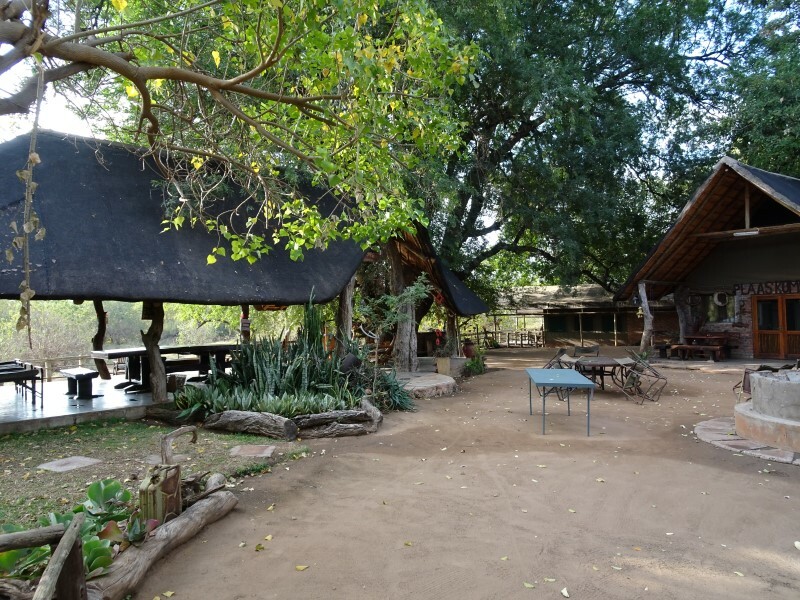 The owners of the farm spread fruit around the grounds in front of the viewing area and waterhole, which attracts the elephants and provides great game-viewing opportunities. We thought we’d struck gold with two young males who walked off at sunset; but, by the time we’d begun our dinner, trumpeting and rumbles announced the arrival of a twenty-plus strong breeding herd. The sounds they made munching and breaking branches off trees were a reminder of how much vegetation elephants consume. 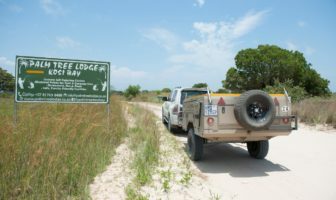 It was only after the elephant-viewing that we had a closer look at the communal facilities and camp kitchen − which came with everything, from the fridge to the cooker, microwave, kettle, toaster and full crockery and cutlery set. There is seating for about twenty people around the massive fire, and this is the place to be in the evening; it would be the ideal venue for a family reunion or gathering. 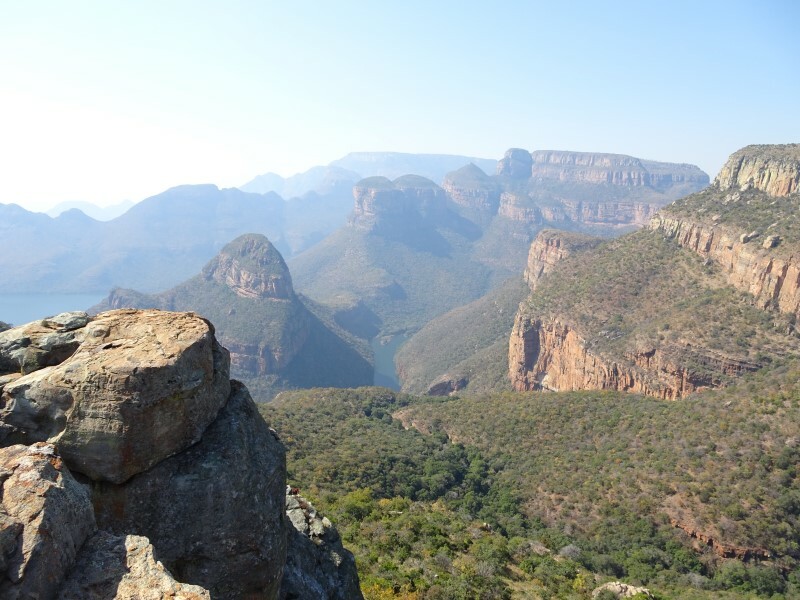 With our visit to Kruger booked well in advance, we had a week to spare, and decided to visit the Blade River Canyon region. The area is full of beautiful mountains, green scenery and waterfalls. This was a big change for us after months in the dry regions of the West and central parts of Southern Africa. We stayed here for four days and made the Panorama Rest Camp in Graskop our base. I had never before seen a more breathtaking view from a campground pool. It’s a shame that it was winter, and too cold to take a dip. From here, we went on day trips to see the highlights of the region − visiting God’s Window, The Pinnacle Rock, a number of waterfalls and the Blade River Canyon. Then we were on the way to Kruger’s Punda Maria gate at the northern end of the park. As we were not a rush, we thought that we would drop in at Magoebaskloof. 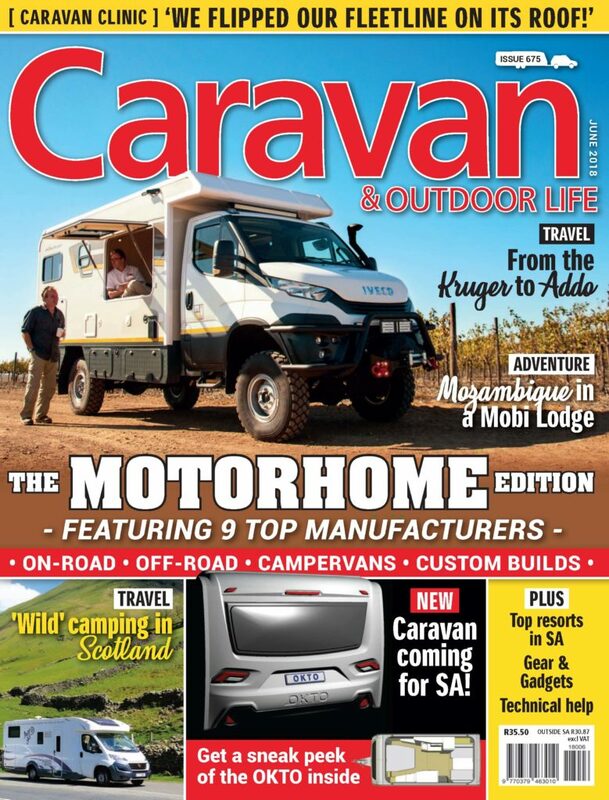 Thanks must go to Richard van Ryneveld for his trip report in the April 2017 issue of Caravan & Outdoor Life, which brought us into this region. Who would have thought that this area was so steeped in history and surrounded by such beautiful mountains and rainforest? 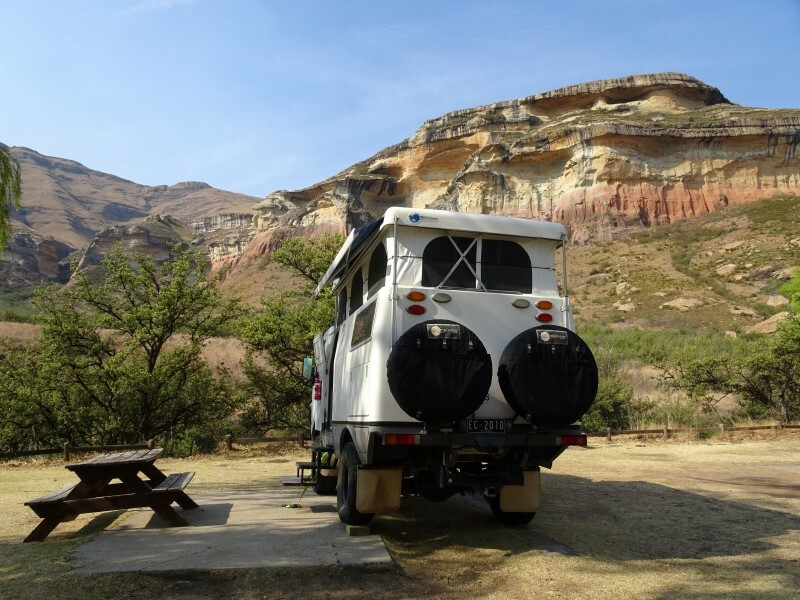 Magoebaskloof Rest Camp was a worthy hub from which to explore this part of the country. 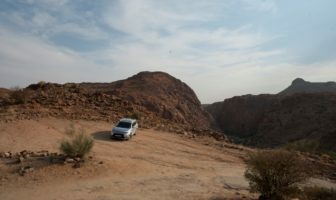 To save ourselves driving time, we decided to stay in a camp outside, but near, the Punda Maria gates, so that we didn’t waste our precious time in getting there. Our first day was a mix of highs and lows. Our wildlife score was high, and the behaviour score of our fellow human beings was low. We watched the approaching wildlife at the waterhole with about another fifteen people. When a group of elephants approached, it had become darker and the light was too poor for photography by conventional means, but nobody bothered to switch their flashes off. It wasn’t a pleasant or enjoyable evening, thanks to fellow travellers who had lost respect for the resident wildlife. What a difference a day makes. We decided to take the loop roads and byways south on a day drive, in the hope of having intimate one-on-one animal encounters… and, boy, did the animals deliver! Other than well-over a hundred elephants, hundreds of buffalo and many of the prolific species, we had some very special encounters. On one of the side loops in the morning, we noticed a fresh kill – a male buffalo – but it looked pretty much untouched. We waited a while in the hope that the carcass would attract some predators, but nothing happened, so we made a mental note of the area so that we could come back in the afternoon. 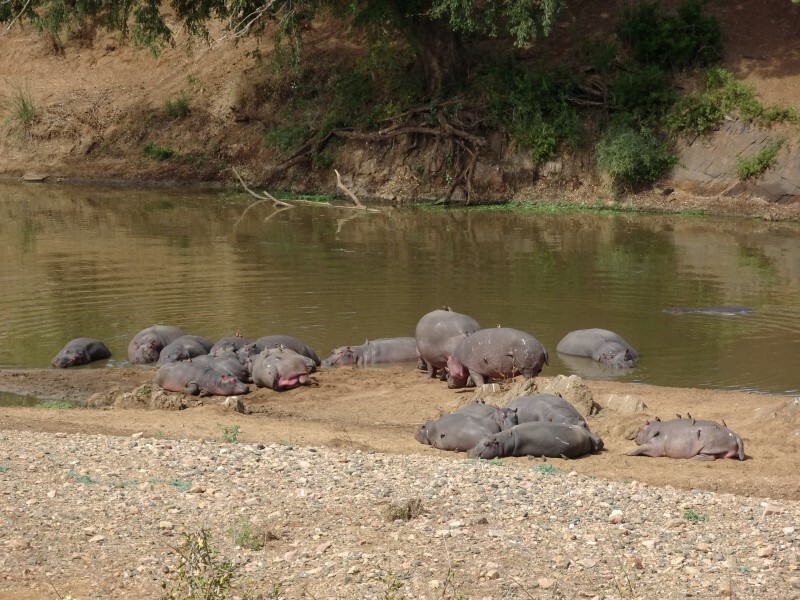 A few kilometres down the track in a river bed, we came across 25 hippos enjoying the morning sun on the beach. Oxpeckers were all over them, cleaning the occasional wound and removing parasites. We were just taking a brief video when something spooked them, and the whole herd stampeded into the river. The trampling of a hundred hippo feet and the rushing and foaming of the water was an impressive display, followed by honking and heavy breathing after the rush. Hippos in the Kruger National Park. 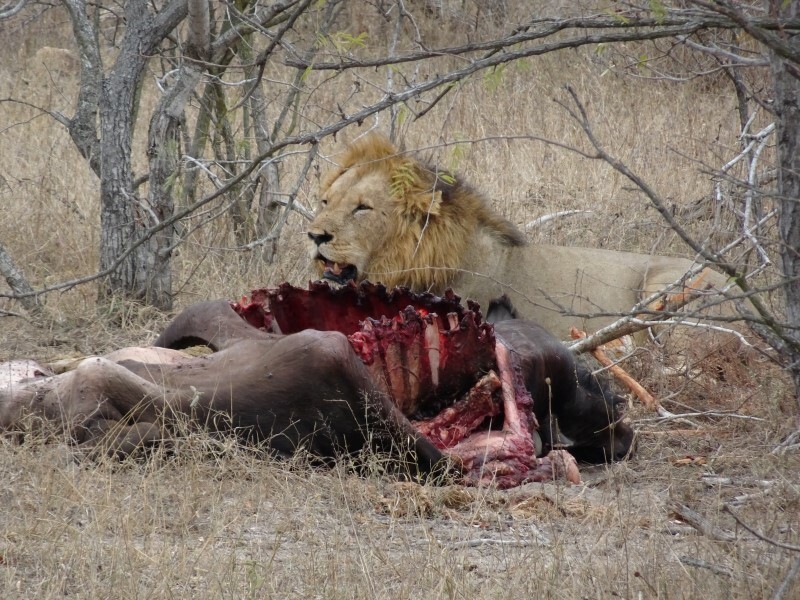 We returned to the buffalo carcass in the afternoon, and found a male lion gorging himself on the spoils. He had ripped the side of the buffalo open and taken meat off the head. We sat in awe in our vehicle, a mere ten metres away. The lion gave us a quick look over his shoulder and then continued with the job at hand. We could hear the crunch of the bones and the tearing of the carcass. We learned later that the kill had been made in the morning hours, by the two resident lion brothers. The male lion gorging himself on the buffalo carcass. 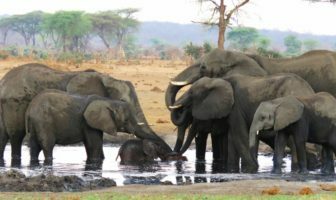 That night, we decided not to visit the waterhole because we were afraid that another mob of unruly tourists would spoil the day, but then we heard trumpeting and commotion there at 22:30 hrs. We couldn’t resist, and went off to find twenty elephants arriving for a drink and playing in the water, which was being illuminated by the floodlights provided by the parks management. After about ten minutes, a dark wall seemed to appear out of the bush and roll towards the waterhole. It became apparent that a massive herd of buffalo had arrived for a drink. With about twenty animals abreast, wave after wave pushed towards the waterhole. The mighty herd of elephants thought it was better to make way for the buffalo, and retreated with trumpeting sounds, screeching and shaking their heads. The waterhole was filled with buffalo, and one could almost see the water-level drop when a herd of that size started drinking. Within a few minutes, the herd moved on and the elephants decided it was safe to return. Next, we stayed at Balule camp, which is a small and quiet camp in Kruger, with no power. We arrived there early and enjoyed the relaxed setting. By sunset, the hyenas had started to whoop and patrol the fence line. We finally had our close encounter with hyena, but were still hoping to see Leopard before we left the park. The next day was filled with luck, as we encountered our first leopard walking along the side of the road, literally three metres from the vehicle. We couldn’t have had a better view. It followed the road for a while, and then disappeared in the long grass. As we moved on, just metres from the sighting, a loop road started − going in the direction the leopard had been heading. Here she was again, lounging under a tree. We spent an hour watching her while having lunch. And we were not yet out of luck – we also had three rhino encounters, making a total of seven rhinos on those three occasions. 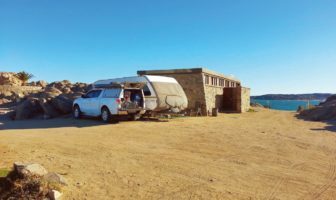 It was impossible to find a campsite for the following two nights, and we were also needing to stock up with supplies, so we booked in at a campsite outside Hazyview. And what a find that was! Kiaat Bungalows and Campsite is a neatly-kept property with beautiful gardens and campsite lawns. The ablutions are immaculate and fitted out like hotel bathrooms, including proper hand towels. 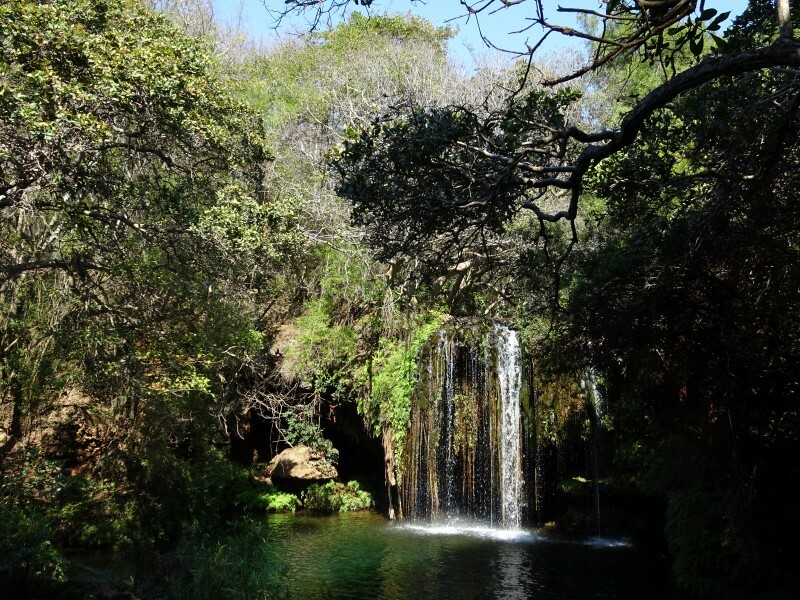 As it is so close to the Phabeni gate, it is an ideal launching point for daytrips into the park, and starts or finishes to your stay. There were more sightings of rhino, lion, and hyena on our last two days in Kruger. These were the highlights, but it’s so easy to forget about the more prolific species in all the excitement. Everything we read about Swaziland is true. 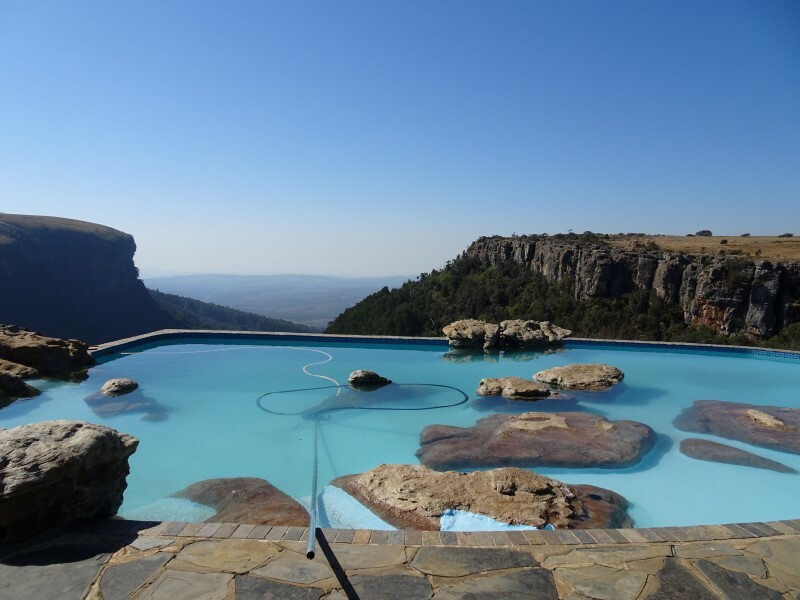 Swaziland is easily overlooked as a weekend destination, until you realise how much there is to see and do. 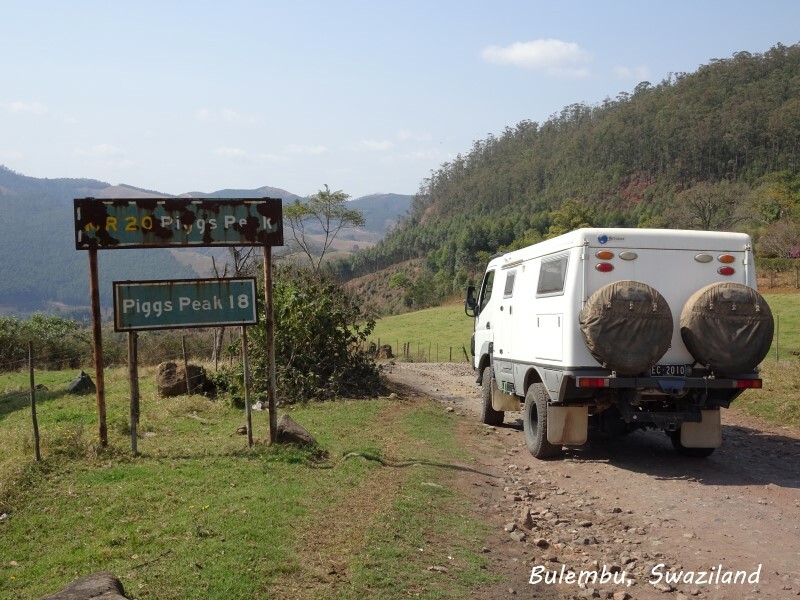 We entered Swaziland from the north-western border post where the sealed road on the SA side turns into a rough dirt road used by the logging companies. A vehicle with high clearance is needed to get through on a dry day, but the rewards of seeing spectacular scenery is great. 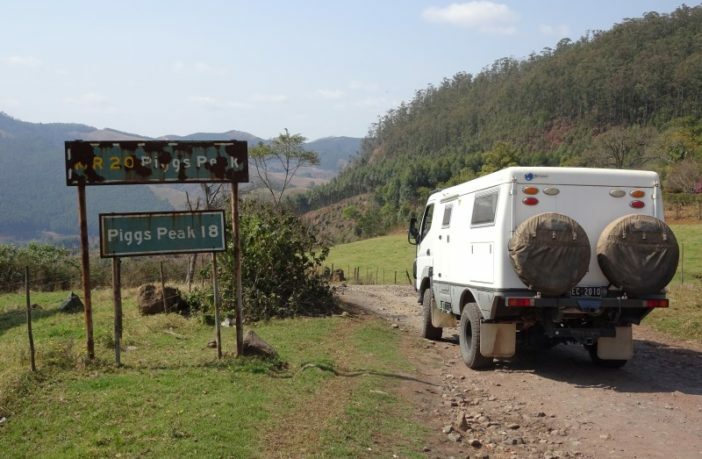 After about twenty kilometres, the rough dirt road turns into a smooth highway at Piggs Peak. We found the kingdom of Swaziland to be a pleasant place where the people were friendly and the services great. We stayed for four nights at the Mlilwane Game Reserve. After a long time in the bushveld with free-roaming predators and fenced camps, it was a pleasant change to be able to go for extended walks on well-signposted tracks. The highlight at Mlilwane is the nightly arrival of warthogs at the communal fireplace, where they sleep all night! We wished we had more time, but our pre-booked trip to Madagascar was approaching fast. 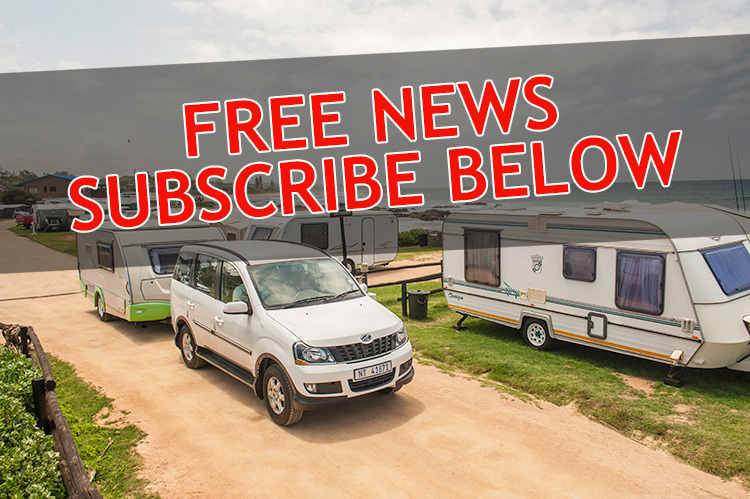 We got organised in Richards Bay at the Richards Bay Caravan Park, where we left the vehicle securely parked before we caught a plane to Johannesburg, and then a connecting flight to Madagascar’s capital, Antananarivo, the next day. Madagascar is nothing like the mainland − no camping or touring here. All I can say is that it is worth visiting if you are interested in rare and endangered wildlife, and prepared to go the extra mile for it, as 90% of the rainforest and habitat has been lost. 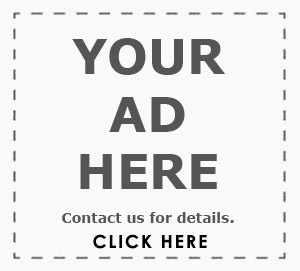 To get the most out of your visit, you will need a local guide for the duration of the stay. Back in Richards Bay, we spent a few relaxing days at the Richards Bay Caravan Park. Michelle and the team were fantastic and truly deserve their ranking in the Resort of the Year 2016 award. 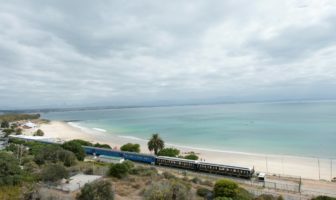 With only four weeks to go before our EarthCruiser would be shipped back to Australia from Port Elizabeth, we made our way south to meet the ship. 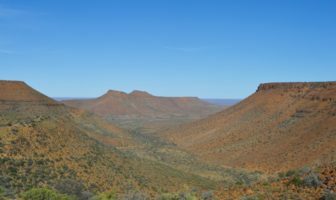 The first highlight on our journey south was the Golden Gate Highlands National Park. 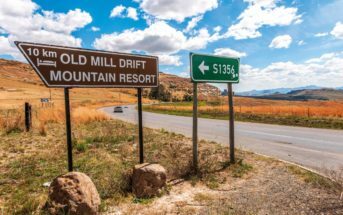 It has an abundance of beautiful rock formations, hiking tracks and wildlife, which sweetened our stay at the northern end of the Drakensberg. Glen Reenen Rest Camp in the Golden Gate NP. We next visited the Injisuthi Camp on the eastern side of the Drakensberg, just south of Monks Cowl. Unfortunately, in both the parks and in the surrounding countryside, we were unable to experience the full beauty of the region due to the season and the prolonged drought. The air was very hazy with many fires raging – some were wild-fires and some were back-burning operations. 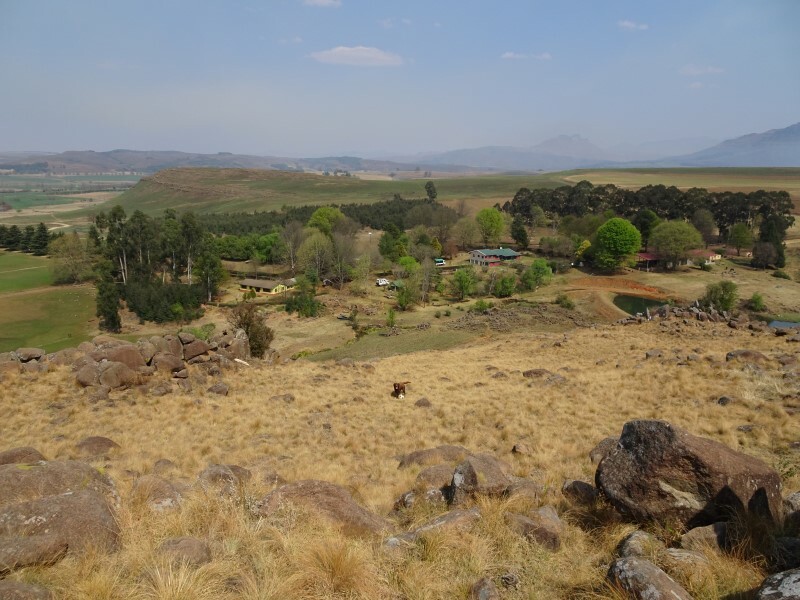 We moved on to the southern end of the Drakensberg earlier than we’d intended, and chose the Khotso Horse Trails in Underberg as our base to explore the region. The landscape was considerably greener here. 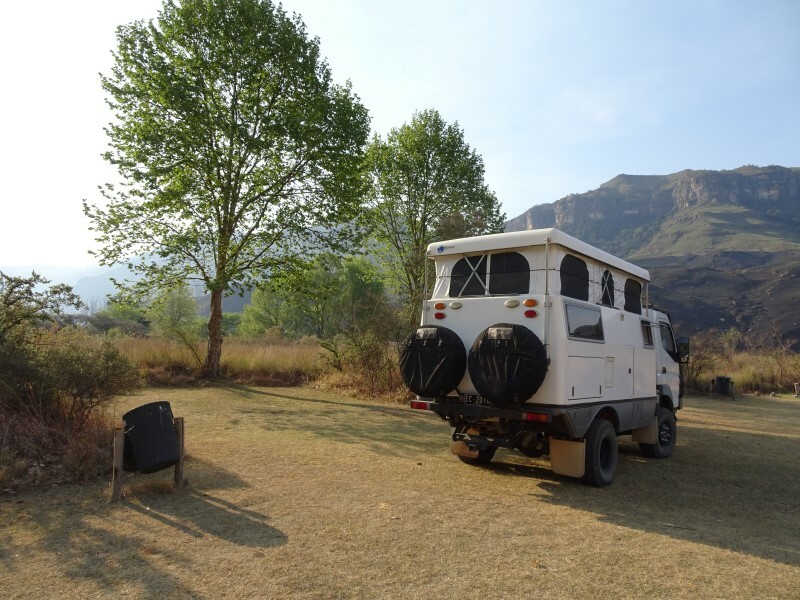 Khotso provides rustic-but-nice and comprehensive facilities, and they are close to the iconic Sani Pass. The view from Khutso Horse Farm. Travelling for an extended time means having to plan for the seasons. From March to the end of August, we could not have asked for better weather, but we’d always expected the last month of our trip to be affected by changeable weather. Richards Bay was stormy and rainy, with the foreshore being washed away. The Drakensberg region was reduced to scorched ground by wildfire, burn-offs, hot, dry winds, and drought. In Scottburgh, we encountered high winds and horizontal rains again. Port St. Johns gave us a brief break before the wild weather on our way to East London and Port Elizabeth, so we decided to make Port Elizabeth our base before shipping the vehicle out. It was the right choice: with school holidays and public holidays coming up, we managed to catch the last few camp sites. Addo Elephant National Park was our last chance to see African wildlife, and we made the most of it. It was hard to leave the last breeding herd of elephants that we watched at the waterhole at Addo, knowing that we might never again have a chance to see these magnificent animals in their natural habitat. 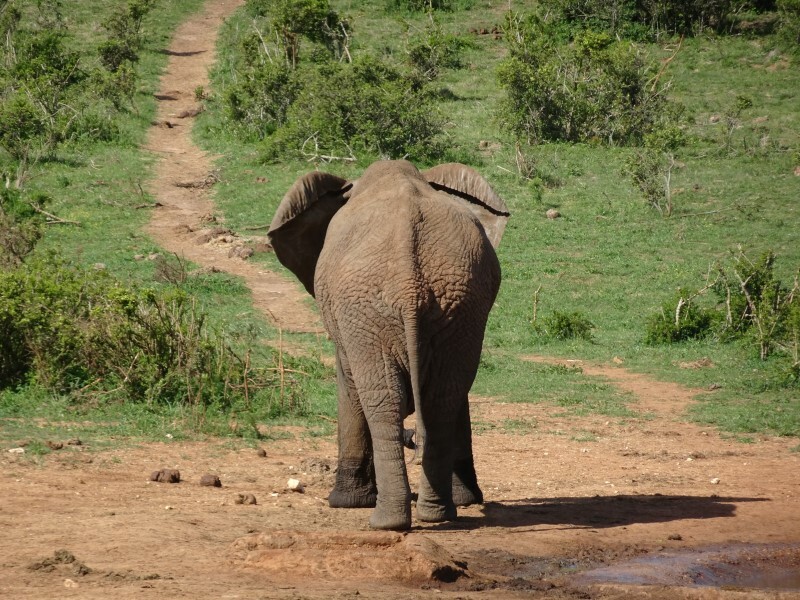 An elephant in Addo NP. With Port Elizabeth our shipping port for the vehicle via the new Ro-Ro ferry service, we made The Willows Resort outside Port Elizabeth our base. 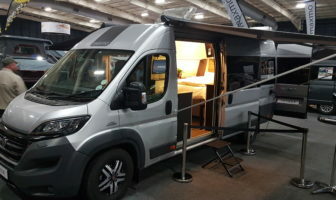 Here we did the final checks before departure, cleaned the vehicle to meet the Australian customs and quarantine requirements, and completed the shipping documentation and insurance arranged with the shipping agent. 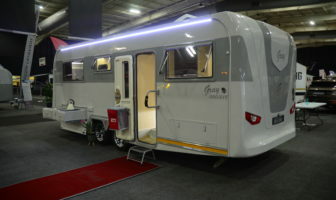 The vehicle and documentation was approved by S.A. Customs for its return to Australia. 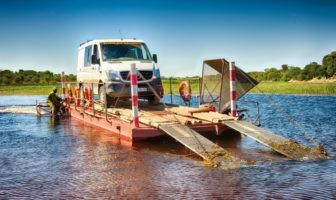 We finally dropped the vehicle off at the port to await loading, and this is where our seven-month journey came to an end. Thank you, Africa, and the many people and experiences that made this trip of a lifetime such a memorable one.